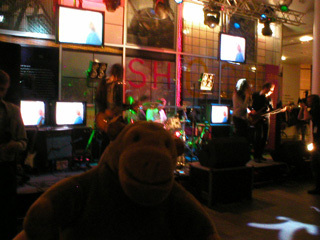 "I wonder if they've got permission to do that"
After Mr Monkey had been downstairs for a while, the DJ was replaced by a live band, the Permissive Society. 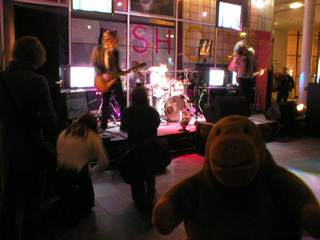 Mr Monkey was interested to see the number of photographers gathered at the front, snapping away as the band played*. You can read about the band at the Permissive Society website. * Much as Mr Monkey and Mr Rik were doing, really.